Become a freaky-fab fashion stylist with the Monster High™ Fashion Sticker Stylist® by Fashion Angels™. 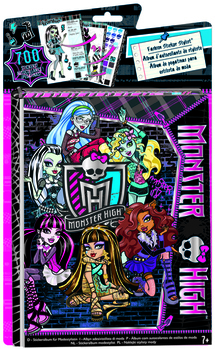 This all-in-one album comes with 20 stylist sheets featuring your favorite Monster High™ characters and 700+ stickers for you to mix and match freaky fashions and scare-accessories. Set includes: 20 Monster High™ themed stylist pages, 700+ stickers (metallic, puffy, paper), and instructional design guide.